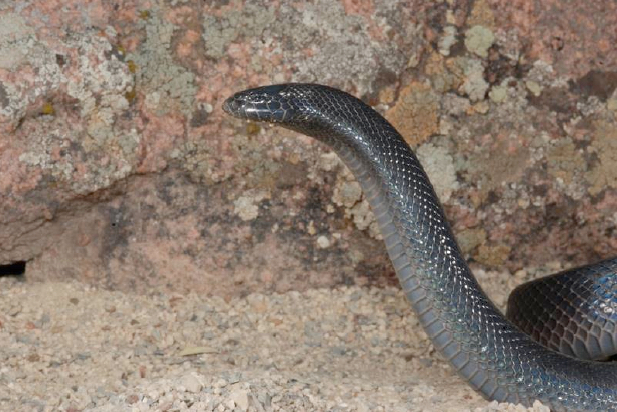 This stance was held for about 90 seconds, after which the snake relaxed and started to drop back to the ground. As I tapped the animal lightly on the caudal part of its body and it immediately resumed the defence display. After this initial display, I set up a photo box to better document this behaviour. I started with the same animal, the larger male, and placed him in the box. He started with the arched-neck display, but after a tap on the body he stood up to a height of about 150mm to look at the source of the harassment. He maintained this position for about two minutes and then started to lower his forebody. When touched, he rose up again and maintained the raised forebody and narrow hood. The second, smaller, male was put into the photo box. Once again, when tapped on the caudal part of the body, near the vent, he quickly raised the forepart of his body, about a quarter of his length to stand at about the same height as the first animal. Another observation made in this species was when a third male was being cleaned. The sequence started with usual behaviour of downward nose pointing and hooding. Then the animal made a tight coil with its head in the centre and its body tightly coiled around it. 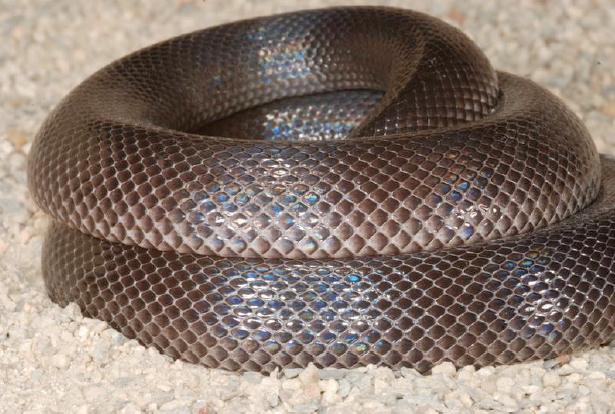 The tail was left out of the coil, similar to the regular behaviour of Prosymna. This behaviour was maintained until the animal was left alone for a few minutes. Upon further harassment, the animal re-assumed the corkscrew position. This behaviour was replicated a few weeks later by the same animal during a photographic session by David Northcott. These behavioural displays are believed not to have been previously documented. S. Spawls, D.
Broadley and W. Wuster later confirmed that they had never seen or heard of this behaviour in this species (pers.com).